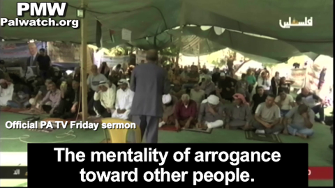 A preacher on official PA TV taught that Hitler was one of a series of people sent by Allah throughout history to punish the Jews because of their evil behavior, and to teach them a lesson. 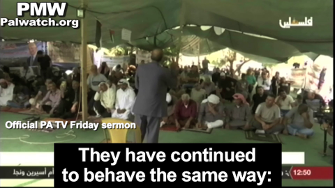 However the preacher Masoud Rayyaan, a lecturer on Islamic Shari'a at Al-Quds Open University, taught in Friday's sermon that in spite of all these punishments the Jews "have not learned from the events of history," and continue their evil ways. "They didn't learn from what Hitler did to them, and the kings of Europe, and Spain - they didn't learn." "They didn't learn. They have continued to behave the same way... Those [Jews] have not learned from the events of history." The sermon was preached at Khan Al-Ahmar, a site where Palestinian Bedouins have illegally erected dwellings and a school and which is slated for destruction. The preacher was filmed from behind and his face was not visible. PMW reported on another antisemitic preacher on PA TV this month who also demonized Jews, claiming they "dance and live on the body parts of others" and that "there is no global corruption that they are not behind." Click to view other antisemitic statements by the PA.
Masoud Rayyaan, lecturer on Islamic Shari'a at Al-Quds Open University: "Proceed throughout the earth and observe how was the end of those who denied (Quran) ... The occupation government hasn't learned from history, from the corruption of the Children of Israel the first and second time. It hasn't learned. They [The Jews] didn't learn from what Nebuchadnezzar did to them. They didn't learn from what Titus, the great Roman leader, did to them. 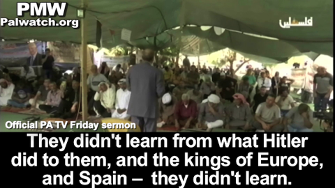 They didn't learn from what Hitler did to them, and the kings of Europe, and Spain - they didn't learn. They have continued to behave the same way: The mentality of arrogance toward other people. The mentality of superiority over other people. The mentality of seclusion, the mentality of settlement. This mentality, an ideology of planning and systematically working to incite wars and strife in the entire world. Those [Jews] have not learned from the events of history."